I hope everyone had a good weekend. It was nice and quiet for us. We had the opportunity to sleep in an extra hour on Sunday as Daylight Saving time ended and we moved the clocks back before going to bed. With the days growing shorter and colder, I had changed all the bed covers to flannel and piled on the feather comforters. It was warm and cozy for sleeping in. But one cannot snuggle in bed for long with an empty stomach. Few things are better than waking up to some delectable spiced Pumpkin Muffins with Cinnamon Chips and Walnuts for breakfast. These are perfect with a cup of hot chocolate, tea or coffee! These chips are definitely cinnamony but not overly so. 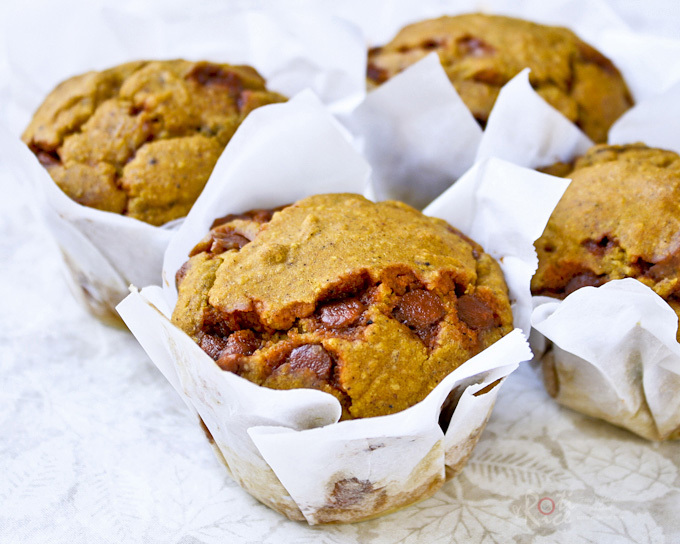 They worked really well in these Pumpkin Muffins and I am sure they will be wonderful in quick breads and cookies too. I think they are seasonal as I have not seen them before. Hopefully there will be sufficient for everyone to try them before the season is out. I changed things up a little and made these muffins gluten-free using a combination of oat flour, tapioca flour, and corn starch. Yes, oat flour is gluten-free but it is best to use Bob’s Red Mill Gluten Free Oat Flour to be absolutely sure that it is not processed in facilities that handle gluten containing grains. These muffins turned out really well and seem to puff up a little more than my Gluten-Free Banana Blueberry Muffins. I am not sure if using milk gives better results with gluten-free flour or simply because there was just a little more batter with the addition of the pumpkin puree. I used milk in this recipe as I did not have any buttermilk on hand. The recipe below includes both gluten free and traditional versions. Preheat oven to 350&#176F. Line a 12 standard size muffin pan with muffin liners. Combine all dry ingredients in a medium-sized bowl. In a large bowl, add all wet ingredients. Using a hand whisk, whisk till combined. Add dry ingredients to wet ingredients. Fold in cinnamon chips and walnuts. Divide batter evenly into lined muffin pan about 2/3 full. Bake for 23 to 25 minutes or until a toothpick inserted in the center of muffin comes out clean. Allow muffins to cool in the pan for 5 minutes. Hmm, look so yummy, wish to have some of my tea break now. Biren, I noticed u like using squash & pumpkin in your cooking. Fantastic, as these aren’t easy ingredients. Kudos to u! Oh, I love those bear-bear muffin cups. Sooooooooo cute! Fall is my favorite season and I do like all those fall produce like squashes, grapes, and apples. My first time using those silicone bear liners. They are cute! Hi Biren – I’m so happy you enjoyed this muffin recipe. It has become one of my family’s favorite morning treats. I will definitely be trying your gluten free version for my granddaughter. Thank you so much for your nice words and link to my blog. With cinnamon chips? I’ve now got a hankering for these…. 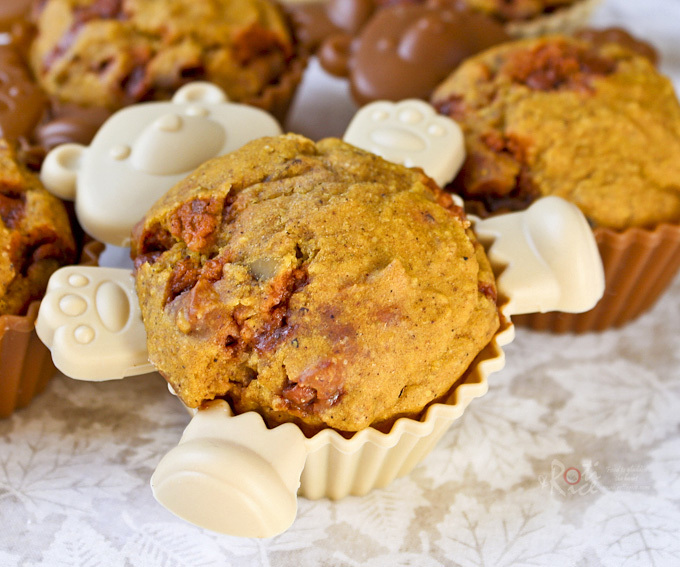 The muffins look so cute in the teddy bear moulds….like a rounded tummy! Oh, yes, noticed your pretty face in your profile picture. Cinnamon chips? Never had them…those muffins look terrific! These muffins look so delicious and I love your cutie bear muffin cups! my daughter would go crazy over the bear holders. They are so cute!! Oh Biren, these muffins look awesome, and I like the idea of cinnamon chips. Beautifully done. Would love those muffins anytime of the day! Sounds so tasty! I am a SAHM too. Cheers! I love the recipes that you post. I am hoping to get hold of this Cinnamon chips that you posted. I am curious on how it will blend with your pumpkin muffin batter. Gonna try this as soon as I can. Thanks for sharing! More power!!! Hi Anna, so nice of you to visit! 🙂 The cinnamon chips blended well with the batter. They are like spiced cinnamon cake. Your muffins looks wonderful! Have not seen the cinnamon chips over here before! Will keep a look out for these! Have a nice delicious week, Biren! The bear molds are super cute! Wow, I love pumpkin flavoured things and sounds great with cinnamon chips. Also, LOVING that bear cupcake mold!! Cinnamon chips?? Oh those look delightful. I’ll have to try these, I adore anything pumpkin! Sorry to hear you had trouble finding the cinnamon chips. 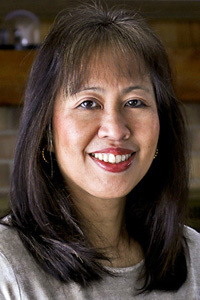 Please check out this store locator link http://www.hersheys.com/recipes/product-locator.aspx. Category: Baking Products, Product: Hershey’s Cinnamon Chips 10oz. The cinnamon chips sound scrumptious here with the pumpkin! Such a nice flavor combo Biren. And I love your teddy bear cupcake tins – so cute! The Muffins look awesome. Lovely cupcake tins too!! Wow! 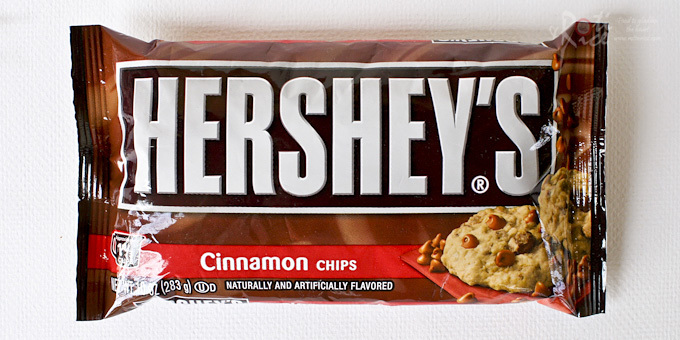 I have never heard of or seen cinnamon chips, especially by Hershey’s. 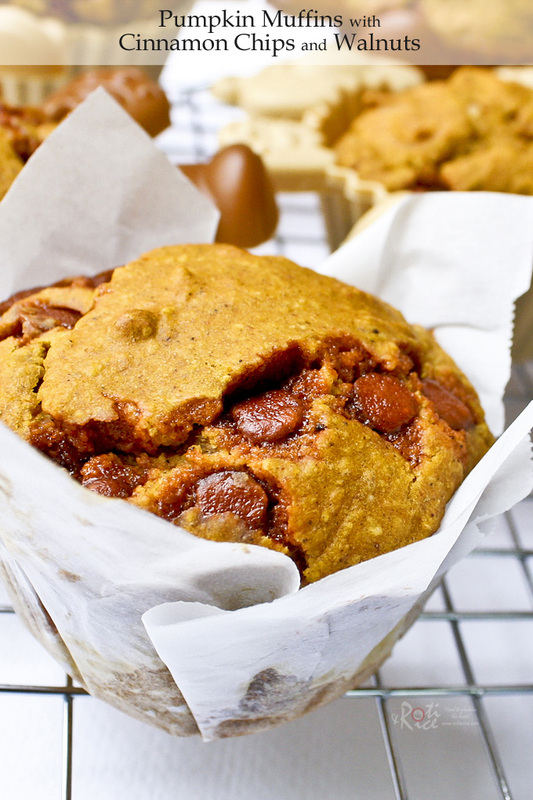 Your muffins look magnificent, and the parchment paper wrapping is a genius idea! I love your site. I hate to be a pain, but I do have a question. For the recipes that require corn starch, are there any alternatives? My husband can’t have corn and I would love to make these recipes for him.